How good a student were you in your school days ? ~ was History an interesting subject whilst you studied ?? do you now realize that whatever was taught and learnt were a different side of history, in reality, we should have read more about the real India and the struggle !!! Before proceeding further, what attracts you in this picture, the revolutionary in the foreground or the monument in the background .. ! We read that India got freedom without shedding blood – the path of ahimsa as shown by Gandhiji ~ and in the process, we perhaps failed to glorify and honour many of our martyrs. Is it not true that Freedom was gotten only after years of struggle, massacre, bloodbath and unconditional sacrifices; thanks to the undying efforts of hundreds of freedom fighters who left the comfort of their homes to fight the British colonial power. These freedom fighters also included thousands of women who courageously stood up to the British and massively contributed to the Indian independence movement. On 6th February 1932, the whole ambience of convocation Hall of Calcutta University was disrupted by volley of bullets fired by a young girl. 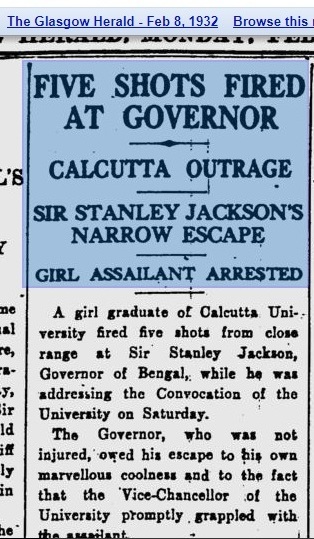 The young and courageous girl was arrested on attempt of assassinating Stanley Jackson, the British governor of Bengal. How many of us know this courageous student who dared to shake the British Empire with her revolutionary action ? – is that our fault or those who wrote history for us !?!?!?. Yet, we know the history of British East India Company too well ! The East India Company (EIC), was formed to pursue trade with the "East Indies" (in present-day terms, Maritime Southeast Asia), but ended up trading mainly with Qing China and seizing control of the Indian subcontinent. Originally chartered as the "Governor and Company of Merchants of London trading into the East Indies", the company rose to account for half of the world's trade. During its first century of operation, the focus of the company was trade, not the building of an empire in India. Company interests turned from trade to territory during the 18th century. Company rule in India effectively began in 1757 and lasted until 1858, when, following the Indian Rebellion of 1857, the Government of India Act 1858 led to the British Crown's assuming direct control of the Indian subcontinent in the form of the new British Raj. From 1690, a governor represented the British East India Company in Bengal, which had been granted the right to establish a trading post by the Nawabs of Bengal. The man whom we know in Madras, Robert Clive was the Governor of Bengal during 1757–60 and again during 1765–67 and established Dual Government in Bengal from 1765 to 1772. This is no post on British history, though ends with some Cricket connection of a Governor of Bengal. The courageous girl whom we failed to honour is Bina Das by name, (1911–1986) daughter of a well-known Brahmo teacher, Beni Madhab Das and a social worker, Sarala Devi. Bina Das was a member of Chhatri Sangha, a semi-revolutionary organisation for women in Kolkata. On 6 February 1932, she attempted to assassinate the Bengal Governor Stanley Jackson, in the Convocation Hall of the University of Calcutta. She was not a trained assassin, fired five shots but failed and was sentenced to nine years of rigorous imprisonment. After her early release in 1939, Das joined the Congress party. In 1942, she participated in the Quit India movement and was imprisoned again from 1942-45. From 1946-47, she was a member of the Bengal Provincial Legislative Assembly and, from 1947–51, of the West Bengal Legislative Assembly. The man who was shot at was – Stanley Jackson, written in history as Sir Francis Stanley Jackson GCSI GCIE KStJ. He was born in Leeds, played for Cambridge University, Yorkshire and England. He reportedly spotted the talent of Ranjitsinhji. He captained England in five Test matches in 1905, winning two and drawing three to retain The Ashes. He was also the first batsman to be dismissed for nervous 90's on test debut. He was President of the Marylebone Cricket Club (MCC) in 1921. He was elected as a Member of Parliament at a by-election in 1915, representing Howdenshire (Yorkshire). He served as Financial Secretary to the War Office 1922-23. In 1927 he was appointed Governor of Bengal and in that year was knighted with the GCIE and was made a member of the Privy Council. In 1932, he was shot at by Bina das, but ducked five pistol shots fired at close range in the Convocation Hall of the University of Calcutta. The attacker was tackled and disarmed by Lieutenant-Colonel Hassan Suhrawardy (the first Muslim Vice Chancellor of the University of Calcutta), who was knighted by the King for his heroism. Now recall, search your history books on what you studied, on whom the lessons had been made and think what should have been read and remembered ! !